Here’s our guide to lockpicking in Kingdom Come Deliverance, how to actually pick locks and where to find more lockpicks when yours inevitably break. As more strategies emerge, we’ll update this page with the most up-to-date knowledge. Don’t worry, you’re not alone. Lockpicking in Kingdom Come Deliverance is super tough and takes some real getting used to. The game recommends that you have “one or two” spare lockpicks at all times, but in truth, you’re probably going to need closer to five or six. What you have to do is, with the right stick or mouse, move the cursor until it gets big and golden. Then you have to rotate the left stick or press the “D” key, to turn the lock mechanism while keeping the cursor over the golden spot. PC players have it much easier since they only have to hold one key. On consoles, you not only have to rotate the left stick perfectly but have a rumble to contend with as well. Analogue sticks aren’t very precise at the best of times, let alone when you’re trying to pull of minute movements while the controller buzzes like a Nokia 3310 on vibrate. Turn vibration off – This way you only have to concentrate on keeping the cursor in the right place and turning the left stick smoothly. On PS4, go to “Settings” on the console home menu, then “Devices”, then “Controllers”, then uncheck “Enable Vibration”. On Xbox, go to “System”, then “Settings”, then “Ease of Access”. When you’ve done that select “Controller” and then “Vibration settings”. You can always turn it back on when you’re done. Move the cursor up and down – The golden sweet spot not only moves sideways as you turn the mechanism but up and down as well. If you can’t find the best spot, try moving the right stick vertically. Push the left stick further out – It’s much harder to get the rotation you need if you keep the left stick close to its neutral position. Push the left stick all the way to the edge and rotate it in a wide arc. This means you’re less likely to go too far and break your pick. Practice – “Easy” locks are not easy, and you’re not going to get any help from console commands in Kingdom Come Deliverance like in Skyrim or Fallout. 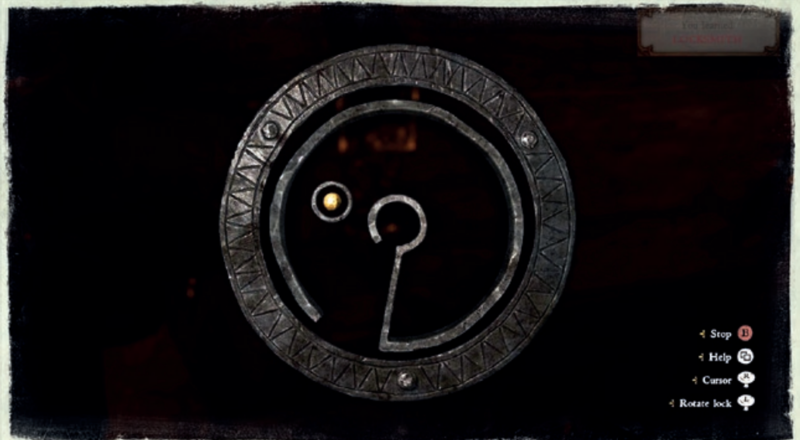 Relatively early on in the game, you’ll be introduced to lockpicking through a quest called The Good Thief that’s supposed to teach you the mechanic, and duly plonks you in front of an “Easy” chest. Don’t bother with that for now, instead walk forward around the building and turn left. A short walk in front of you will be a “very easy” door. This is so much better to practice on initially. Either down a Saviour Schnapps and keep reloading until you get a better feel for it, or just reload your last save when you run out of picks. If you want more practice on Very Easy locks, the two front doors of the houses in the small farm to the immediate northwest of Peshek’s Mill are locked at night. It can be a bit inconsistent as to whether people lock their doors, but if you can catch them at the right time it’s a good experience. Once you feel confident, return to the chest Miller Peshek first told you to practice on. When you do manage to unlock it, it automatically locks itself again after you open it, close it and walk away for a second. Now that you’re more comfortable, you can farm lockpicking experience on this chest, which gradually makes the mini-game easier and easier. From here you’ll be better equipped to crack locks later in the game. For an easy experience boost, you can pay Peshek around 60 Groschen to teach you the basics of lockpicking. If that seems like too much to part with, take a look at our guide to making money in Kingdom Come Deliverance. Once you reach level three, you’ll be able to buy a perk that makes your lockpicks last 50% longer. This is incredibly useful and will improve your lockpicking ability even more. Lockpicks are bought from many of Kingdom Come Deliverance’s traders and merchants, as well as gifted by some NPCs. When you’re trying to get out of Talmberg, you can buy a lockpick from the trader by the main gate for around 18 Groschen. That’ll probably be more than you have, so go and ask Lady Stephanie for some cash. Once you’ve collected some more cash, it’s a good idea to come back and buy this trader out of his whole stock of lockpicks. In Rattay, if you speak to the Miller after you wake up, he’ll give you a side quest. If you accept, you can then talk to him again and ask him to teach you how to lockpick. Doing so nets you five lockpicks. Once you’ve completed The Good Thief side quest, the best trader to buy lockpicks from will be Miller Woyzeck who you sell stolen goods to. He has a large inventory of lockpicks, and stocks a lockpicking skill book too. You can learn to read by completing the Mightier than the Sword side quest.